Downhill racing comes down to a few minutes of autopilot riding that seems to go by in a matter of heart beats. Rider, machine, race course, weather, preparation and luck all contribute to the final result. What most people outside of the race tape don't see is the week’s worth of preparation that goes into that single race run. 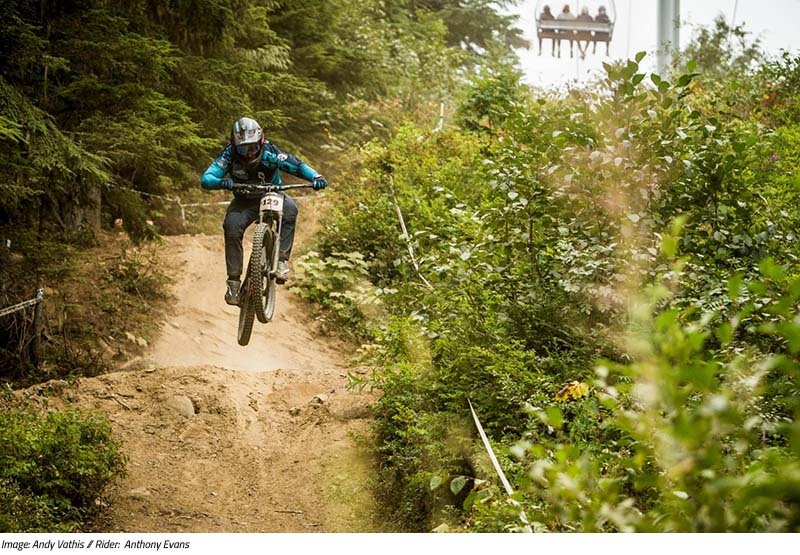 With that single run in mind, here’s a day-in-the-life diary (or 7 days to be exact) for Sovereign Cycle team rider, Anthony Evans at the 2017 Crankworx Canadian Open DH on this entry of Race Diary. It's a typical race morning and it's been raining all night. The whole weekend has been evenings of monsoons and mornings of sunshine, but I can't complain after 40+ days back home in the Okanagan without rain. Breakfast, nerves, warm up, practice runs, equipment check and I'm in the gate. 5 second count down and I’m experiencing the familiar light feeling of an adrenaline fueled race run. Some good moments, some close calls, a lot of sprinting, and I come across the line in 4th. Having seeded 11th the day prior I had hoped to come down in better standing. Finishing 14th on the day, I was happy to collect some UCI points having missed the first two Canadian National rounds with a broken leg, but ultimately disappointed in myself for riding too conservatively (a seemingly lingering effect of the injury). I don’t have time to dwell on these thoughts, because it’s time to pack for the tomorrow’s flight and my next race. It’s an early 6am EST wake up. I toss the last couple bags in the car - I have a 6hr drive from Windham NY to Toronto International where I prepare to catch my flight home. Having struggled to recoup race expenses lost due to unexpected injuries, I’ve taken the prepared, but not too prepared mindset by registering for races only a couple weeks in advance. On my way out the door I realize, I haven’t registered for the Canadian Open! 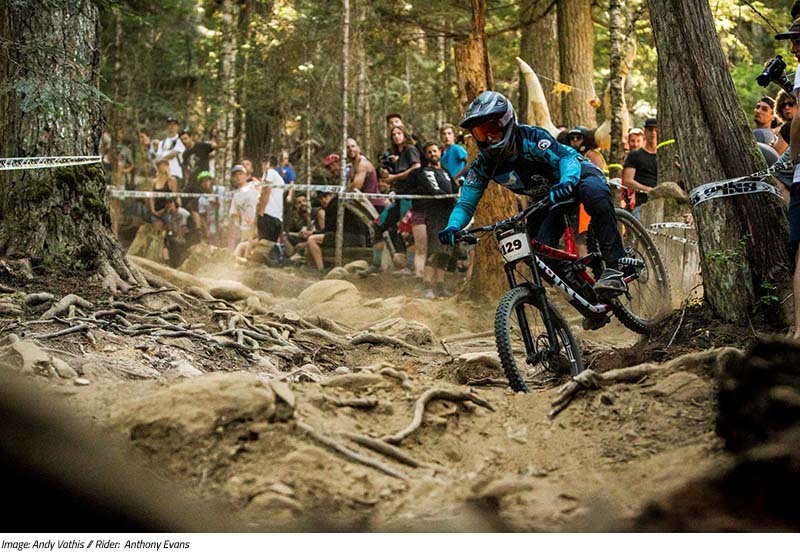 This race is notoriously sold out; with a sinking feeling I rush to the Crankworx website only to confirm my fear. In a panic I talk to fellow athletes and eventually find a spot on their wait list. Cue compulsive email checking waiting for a response! Traffic jams (coming from a small town, they always catch me off guard) and a quick stop to Norco's East coast HQ to say “Hi.” I drop off a tent and other pit supplies, and it’s onwards to the airport for your typical hurry up and wait scenario. It’s now 6pm EST and I’m navigating the Toronto Airport. It's always interesting flying with a bike. I have my system down to 4 bags, 2 checked and 2 carry on, but of course 1 is oversized. My oversized bag includes my partially disassembled bike, 4 wheels, extra tires, riding shoes, armour, spare parts, tools, goggles, lenses, and a floor pump. If I'm lucky, the agent swabs the inside of the bag and it's through; otherwise, it's completely disassembled and each item rolls through for an x-ray. I’ve found that rotors receive a typical eyebrow raise on the x-ray screen. One layover later, I'm home and off to bed in Peachland; it’s only midnight PST! By 8am I’m awake; for me, it’s a much needed sleep-in. After breakfast I make my compulsive email check; still no confirmation of race entry. Feeling optimistic, I start taking parts off the sample prototype frame, swapping them back to my Norco Aurum for the next weekend in Whistler. After two weekends of testing, I'm returning the prototype back to Norco. It’s 11am; 2 bikes built and I’m off to Sovereign Cycle to use a wheel truing stand, return a borrowed EVOC bike bag, and exchange high fives before heading off to Whistler! At 2:30pm I’m finally loaded up and back on the road. Five and a half hours later, I arrive at my friend, Kirk McDowall’s, condo in Whistler where they tolerate my annual Crankworx couch surf. 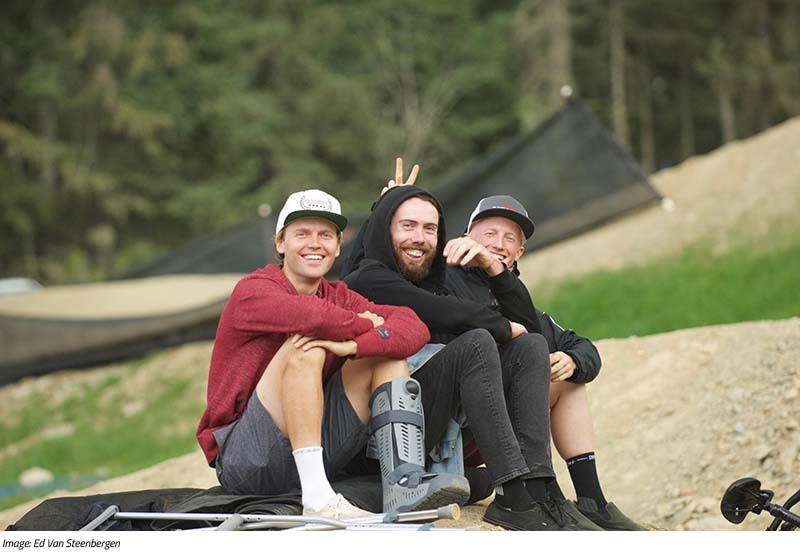 Unfortunately as I pull up, Kirk’s Dad is heading out, on his way to the hospital where Kirk awaits X-rays and a CT scan to confirm a cracked Talus bone in his foot – the result of a digger while training for the Air DH on A-Line. 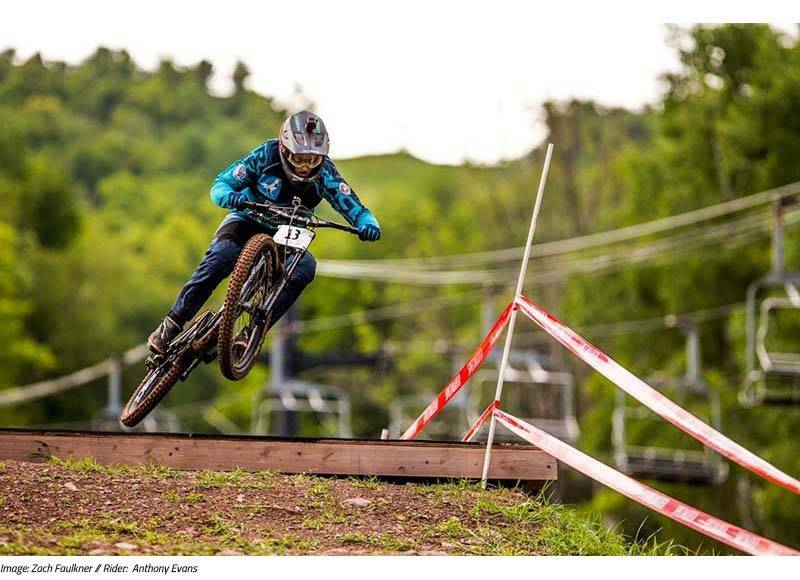 Kirk had just returned from the MSA World Cup with a career best 12th place and had been gearing up for World Champs in two weeks, so this is a real bummer. I feel like my body clock is still on Eastern time, but I manage to haul myself out of bed at 6am for breakfast and yoga, then I start to build my Norco Aurum for Thursday's practice. Cue compulsive email check. I'm in! Registration is open 9-1pm today; obviously I’m not going to blow this one twice! I take a break from building my bike and head into the village to sign up at 9am sharp. Post registration and I’m off to visit the brand tents scattered around the village. It’s the perfect opportunity for a one-on-one with the people who help support my racing - Norco, Smith and Race Face. I bump into Norco's Engineer who’s working on their new downhill bike project, perfect timing having just tested the prototype. After some good discussion we head over to the Norco Factory Racing pits. It’s now 1pm and I receive some panicked texts from my friend Magnus Manson requesting assistance on his bike before he races Air DH at 3pm. Side note: racing can be inherently stressful, but when you're having mechanical problems it can really escalate that anxiety. Purposefully I don't have much going on today; I've learned my lesson in years past, so I blast across town and give Magnus' bike a brake bleed and then a thorough pre-race tune and bolt check. Within a couple hours I’ve managed to meet up with Kirk just in time to catch the bus back to the Village to watch the Air DH (he’s on crutches so it's a bit of a mission). We manage to get to the finish line just in time to watch Magnus drop in for his 4th place run. I finish my day with dinner, yoga, and some TV before heading to bed. After eating 1st and 2nd breakfast, I’m changing tires on all my wheels! It's loose as a goose out there and the Canadian Open seems to be jumps, rocks, and jumps onto rocks. So, I opt for 2.5" Magic Mary DH tires on wide rims with a Huck Norris rim protector and 21psi in the front, a Cush Core insert and 23psi in the rear. By 3pm I'm in my race kit and my bike and I are headed over for the first run down the course. 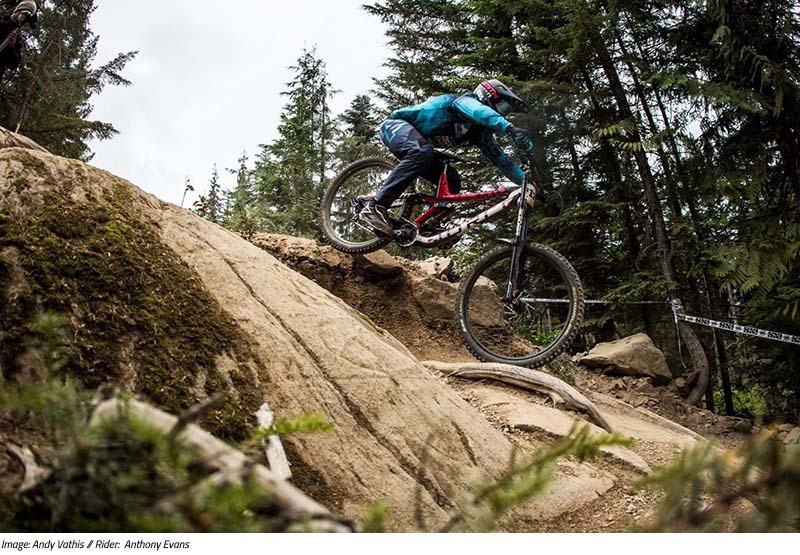 The Canadian Open is tucked between a bunch of other events amidst a running bike park. As you can imagine, for this race, a track walk is not convenient with a limited practice window (4-6:30pm). Having raced this course for the last couple of years I’m familiar with it, minus some of the eroded dirt. The first lap is essentially a track roll, seeing where to put your tires (or not put your tires), where holes are developing, and what corners will offer support. The course can be pretty overwhelming as it is high speed, high risk, and fairly technical. As you start to put the puzzle pieces together it feels like a rugged pump track and it flows pretty good after you check off all the jumps and gaps. With most of the tech behind me I drop into the last chute and cruise into the first of the motor way jumps. “Pull up for it”, annnnd case! Hmmf, maybe a bit too casual? Of course, I’m in plain view of the packed chairlift - cue cat calls. I manage 4-5 laps in that afternoon; I really struggle to push my pace right away on most tracks. I like to ride my lines in practice aiming to have fun, get over the fear of some moves, and then gradually dial up the speed. I arrive back ‘home’ by 7pm where I proceed to drink a swimming pool amount of water, take a cold shower, and wash my gear and bike. Same routine: dinner, yoga, asleep by 10pm. I’m paranoid that I won’t get enough sleep, will wear myself out, and end up getting sick before the race, so I “sleep in” until 8am. As per usual, it’s breakfast, a bit of mobility on the foam roller, and a little bike tinkering. I still feel like I’m getting used to my Aurum after racing the prototype Norco the two weeks, so I make plans to meet a buddy at 1:30pm to squeeze in a Dirt Merchant lap prior to practice. With lunch eaten and my bike ready, I look at my Merino thermal layer, then look outside, then look at my thermal layer again. I decide to go without the thermal layer and head to the Village to meet my friend and do laps. 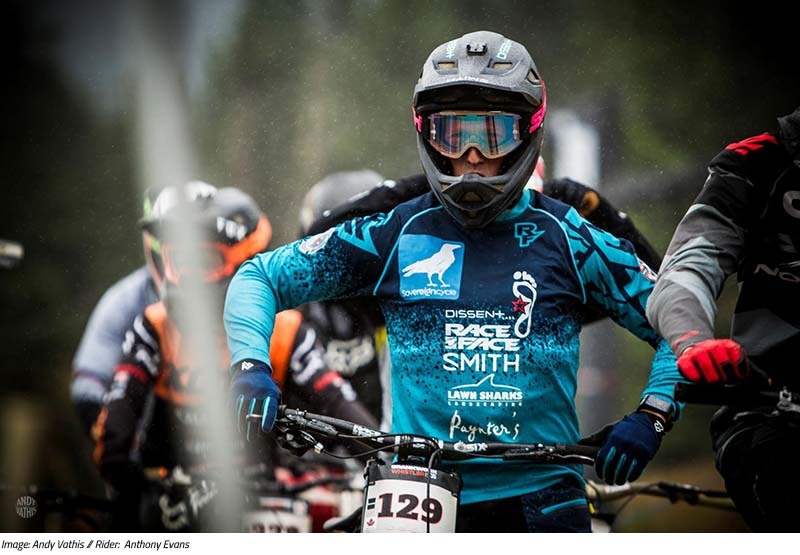 Although there is an athlete priority system to expedite the massive lift lines during Crankworx, the Canadian Open is an extremely popular event. There’s nearly 100 racers in line, so by the time we’re on the chair lift, it’s raining and I really should have put on that thermal layer! I do a good warm up of handlebar push ups, air squats and hip mobility because, yep, there’s another line-up to drop in. This should be interesting, moon dust, rocks, roots and a hint of rain. By 2:30 I finally get my chance to practice. By 3:00pm we are on to our second lap. About a third of the way down I wash out on a root coming into the jump on heckler’s rock. The once bone dry course is starting to saturate and the previously innocent, seemingly polished roots are now offering negative amounts of traction. Hiking back up to inspect new lines, I bump into Yoann Barelli. I haven’t seen Yoann since we raced together in Taxco, Mexico for the Urban DH event. He’s eyeing up the rock jump I just messed up on and looks nervous (I said there was a fear factor to get over with the course didn’t I?!). I’m not sure he recognises me, so I try a one-liner: “Hey dude! This thing works pretty good if you get the line into it right, it’s not nearly as scary as the jump in the middle of Taxco!” To my surprise, it clicked and he remembered. Potentially even more surprising, he remembered the fact that he owed me $30 from Taxco. “Hahaha! Hey man! I Think I still owe you some money from Mexico!” Yoann is a super nice guy, so we end up riding the lift together and catch the last few laps. Practice is over by 4:30pm and I’m feeling pretty good about tomorrow. I head back to Kirk’s to settle in for the night, except he’s getting ready to head out and watch Dual Slalom, crutches and all. Our boy Bas Van Steenbergen, another Okanagan local, had qualified to the top 32. Commence speed eating, speed shower (my hair cut is very conducive to speed showers, more so even to speed drying) and we catch the bus to watch the 6:30pm event. Motivated to get a good spot we hustle up the hill and settle in on top of a landing for a good vantage point. A number of nail biting rounds that see Bas battle head to head and squeak past former Dual Champions and other talented athletes to land himself in the finals. Two valiant runs later, he’s a silver medalist in Crankworx Dual Slalom! I begrudgingly decline the celebratory party invite and head back (it’s the night before a race after all). I agree to take Bas’ gear bag and novelty-sized cheque back to Kirk’s, which made for some funny interactions on the bus ride. I didn’t quite have the conscience to pretend to be Bas, or to pretend I had won anything! It’s 6am and I’m wide awake, struggling to fall back asleep. It’s now 8am and the lingering East coast time zone, race nerves, and a conversation with Ken (another couch surfing downhill racer), has kept me from the last two hours of “bonus” sleep. I’m not hungry, likely nerves, but I force myself to eat a breakfast sandwich with some coffee and water. Hindsight: I may have been able to go without any extra caffeine this morning. After completing my bolt and tire pressure check, I begin my ritual of donning my race kit (typically left side first): chamois shorts with hip pads, Dissent socks specially designed for use with an ankle brace, knee pads, “moto” pants, chest protector, elbow pads, and finally, long sleeve jersey and gloves. It’s crucial that you have a left and right glove; especially on race day, where you don’t need any surprises in the gate! Lift pass, goggles, shoes, another last minute tire pressure check, and I’m off to the races. We have 2 more opportunities for practice runs. The course is busy and there is a constant haze of dust. Visibility is poor, but I’m feeling fairly confident on my lines and I’m riding well. We will need those 1-minute gaps, so the dust has a chance to settle. By 2pm I’m down in the village for a smoothie, then headed back up to the top for my warm-up and race run. I nail the jump into hecklers rock, everything is working well. Next is a long right into a loose chicane; I pushed my entrance speed off hecklers and am forced wider to the right than I had practiced. Committing to the outside, I push into the moon dust and look ahead into the next corner, except my bike doesn’t plant and track like I’m used to! I instinctively unclip and like a fawn on ice, my free foot scrambles to push me and my sliding bike up and off of the dirt. I miss re-engaging my pedal on the following right hand corner as I’m simultaneously trying to weight my outside foot for bike traction. I check up slightly on a long rock face into a big step down to ensure my foot is clipped in – phew! The rest of the run continues on as I hit most of my lines, but I can’t seem to reach autopilot and I struggle to find my comfort zone. It’s a reasonably clean run, I’m lacking some fitness in the sprint portion of the track, I would probably only have made up 2-5 seconds on my time of 3min 10seconds, leaving me in the neighbourhood of the top 40. I congratulate my friend who is in the hot seat while trading race run stories with buddies now congregating at the finish line. We’re all addicted to the feeling of chasing our luck, piecing everything together to make a great run, pushing our mind, body, skills and machine. Yet, I still feel disappointed at another mediocre result. I can hear my Mother already, “At least you’re not injured”! I’m still recovering from my early season injury that left me with plates and pins in my leg, so I have to agree, it’s a blast to be back between the tape, and I’m happy to be working on getting back to speed. 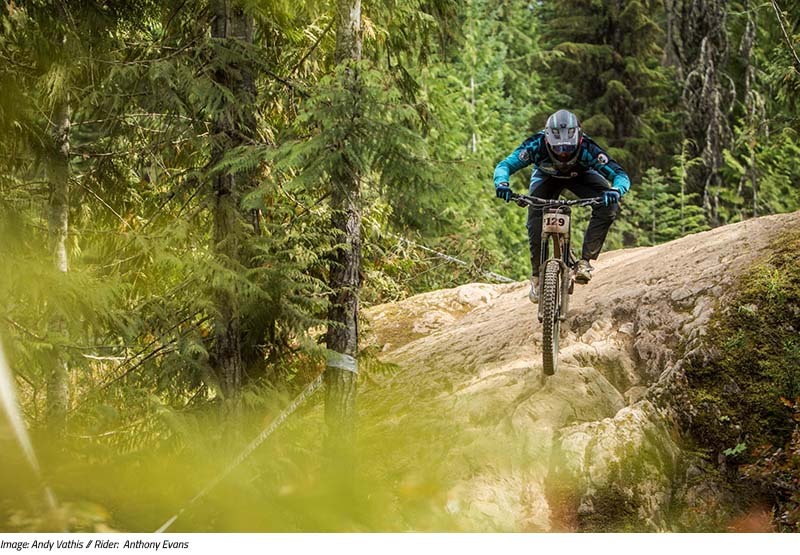 On to the next race, where I plan to pedal a bike up hills and race down - the Canadian National Enduro Series event at Big White Bike Park! Looking for the right gear for your next race? Check out our online store or stop by Sovereign Cycle in Westbank, BC.